Executive function skill building - To Plan & Prioritize, Manage Time, Work through Overwhelm & Procrastination, Increase Focus, Organization, Impulse Control and more. Robin meets with clients in her Apple Valley or Edina Offices or virtually by computer or telephone. 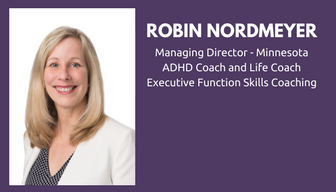 If you can't find a time that works or experience difficulties, please send an email for assistance to Katherine@adhdcoach.life.